Insorex capsules helps to reduce the risk of diabetes and heart ailments. It contains amino acids, which initiates insulin release from pancreas. It controls blood glucose level and supports circulatory, urinary and digestive systems of the body. 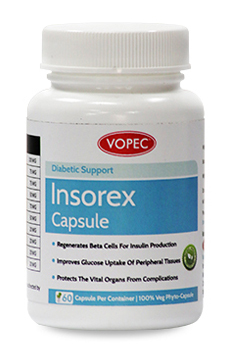 Insorex capsules are the natural herbal formula useful in controlling blood and urine sugar. The capsules contain a formula made from hypo-glycemic herbs that are safe and gentle on the body. This formulation acts to correct metabolic imbalances, reduce blood sugar and adjust the body's resistance to insulin. The capsules have also shown to prevent diabetic complications such as heart disease, kidney disease, blurred vision, persistent infections, peripheral nerve disease, vascular damage and erectile dysfunction. There have been no safety precautions identified during clinical testing. However, avoid use during pregnancy and lactation. Take one to two capsules twice a day after meals. Please keep in mind that it is always prudent to consult your physician for the correct dosage that is suitable for your current condition. Note: It is important to take the prescribed dosage, to prevent any adverse effects. Weight gain is linked to Diabetes. This product can be taken with Lobes capsule to control weight. Daisy P, Balasubramanian K, Rajalakshmi M, Eliza J, Selvaraj J, 2010,‘Insulin mimetic impact of Catechin isolated from Cassia fistula on the glucose oxidation.’ Phytomedicine, Volume 17, Issue 1, January 2010, Pages 28–36. Srivastava B, Sinha AK, Gaur S. Barshiliya Y. Study of hypoglycaemic and hypolipidemic activity of Eugenia Jambolana pulp and seed extract in Streptozotocin induced diabetic albino rats. Asian Journal of Pharmacy and Life Science 2012; 2(1): 10-19. Nain P, Saini V, and Sharma S, 2012 ‘Antidiabetic activity of Emblica officinalis seed extract in streptozotocin induced type-2 diabetes mellitus in rat’, International Journal of Natural Product Science 2012: Spl Issue 1:135. Is diabetes a metabolic disorder? Diabetes is a metabolic disorder characterized by chronic hyperglycemia with disturbances of carbohydrate, fat and protein metabolism. This results in defects in insulin secretion and action. Type II Diabetes is the Non-Insulin Dependent Diabetes Mellitus (NIDDM). This type is treated with, oral anti diabetic medication. Why does the body need insulin? Insulin is required to convert glucose into energy. In the case of insufficient supply of Insulin, cells are unable to convert glucose into energy and finally discharge glucose through urine. The kidneys draw additional water to dilute & excrete glucose through urine. This creates excessive thirst. A diabetic person may lose weight and exhibit other symptoms like blurred vision, nausea and drowsiness. Ketoacidosis makes fat cells break down and produce ketone, a toxic chemical compound that turns the blood acidic. Is there any toxicity concern shown in the study of Insorex? Some herbal chemicals can induce mutations and can also be responsible for future mutations. Mutations are responsible for abnormal cell growth that could lead to toxicity and cancer. To test that there is no such effect, Insorex has been subjected to comprehensive research study. Using analysis known as 'bacterial reverse mutation' method, Insorex has been tested for mutagenicity, toxicity and carcinogenicity. The study showed that there was no significant finding for such toxicity.